Situated in a gated beachfront community in the heart of South Padre Island, this 2BR/2BA Embassy Condominium features expansive Gulf Coast views from a private fourth-floor balcony. The palm-lined property includes access to a shared pool, hot tub, and tennis courts as well as direct beach access. LIVING AREA The sunlit living space is decorated with classic beach-inspired design elements and tile flooring. Sprawl out on a comfy sleeper sofa, love seat, and two armchairs to watch favorite shows on the 32” flat screen TV. KITCHEN & DINING The well-equipped kitchen features all-white appliances and a breakfast bar with seating for four. Enjoy home-cooked meals together at the dining room table set for six. BEDROOMS & BATHS This condo includes two bedrooms that sleep six total. Two full bathrooms are each stocked with a complimentary starter supply of toiletries. The master suite is outfitted with a king-size bed, 32” flat screen TV, and an armchair. The en-suite master bath features a walk-in shower. Two full-size beds are found in the second bedroom, as well as a flat-screen TV, and en-suite bath with a walk-in shower. OUTDOOR AREAS Retreat to the private balcony complete with a bistro table, three chairs, and expansive beach views. Enjoy a crisp beverage and relax while you watch a brilliant sunset. Lounge on the palm-lined deck or take a dip in the pool and hot tub. Pack the beach gear and walk 50-feet for a fun-filled day splashing in the Gulf waters. Lace up your sneakers and play a friendly game of tennis at the on-site courts. 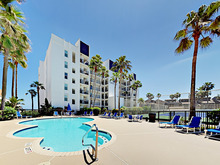 AMENITIES & MORE DETAILS Embassy Condominium amenities include a shared pool, hot tub, tennis courts, and beach access. Outdoor parking is available for one vehicle in the reserved parking space (additional first-come first-serve street parking may be available). An in-unit washer/dryer and complimentary Wi-Fi are provided. This property is registered with the City of South Padre Island Permit No. 2016-172276. LOCATION Watch a dazzling fireworks display over the Gulf waters directly from your balcony; held on Friday and Saturday evenings April - October. Water sports enthusiasts can find rentals at On the Beach for surfboards, stand-up paddleboards, and bodyboards. Or cruise the beach on bicycles, golf carts, and electric scooters from SPI Activities. Both are located within a mile from home. Drive 2 miles to Schlitterbahn Waterpark or walk 7 minutes to Gravity Park for go-karts, mini-golf, reverse bungee, and a climbing wall. Dine on fresh seafood at Blackbeard’s and check out live music at the waterfront bar and grill Wanna Wanna -- both located less than 1.5 miles away.